Every tiny act of defiance adds up. Maybe this one snowflake can start an avalanche. This book was kindly sent to me to review from Sara Grant. I really enjoyed Dark Parties! I liked reading about the concept of the Protectosphere and the effect it had on the society it contained. The idea that all of the citizens of Homeland were variations of one another and that any form of individuality was suppressed fascinated me! My favourite character was Neva, she stayed true to herself and didn't give up, even when her friends did. I really liked reading about the meaning behind Neva's name and how the snow theme was maintained throughout this book. 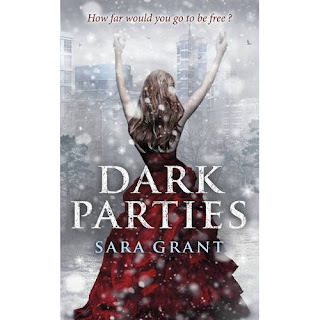 Although I like the cover of Dark Parties, I would have preferred it to look less computer generated and for it to have represented more of the story within. Oh I want to read that so bad! It sounds vaguely like theHunger Games, which I'm a huge fan of.